MMOR (pronounced “more”) is an online, queryable version of an updated, corrected version of the ArchiMate 3.0 relationship matrix – originally described in the article The Graphitization of ArchiMate. 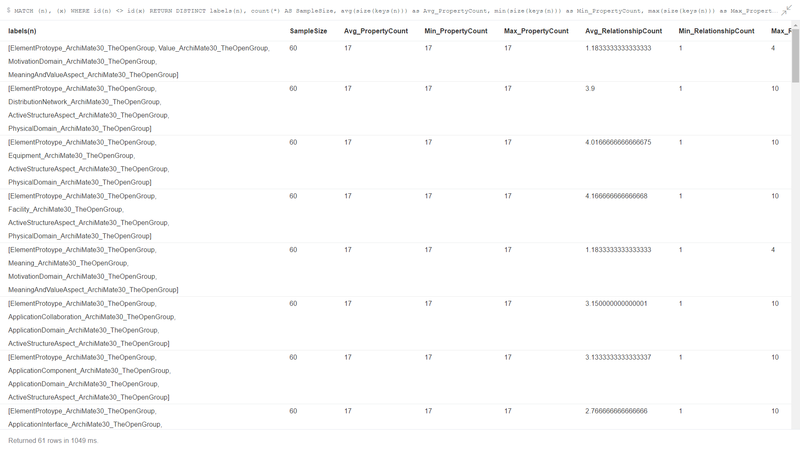 The source data for MMOR is based on Gerben Wierda‘s recent (February 2017) blog article The ArchiMate 3.0 Relations Table…. This article provides an overview – a teaser, actually. I’m working on a more in-depth description that I’ll publish next week. HINT: If you poke around on hyperonomy.com – digital intelligence, you’ll find the “WIP” draft. The above app url, username and password provide you with read-only access to the MMOR graph database – you can’t hurt anything. Please go ahead and try it using some of the sample queries I’ve documented below. CAVEAT: There are zero guarantees on my part in terms of the availability, reliability, or performance of this hosted solution. I’ll be making changes with no advance notice. TIP: After you’ve run your first query, in the bottom-right corner of the visualization, turn Auto-Complete to the Off position by clicking on the icon. Return and visualize the relations in the MMOR where the source element is a Node and the (source and) target elements are members of the Technology domain, both Core as well as Derived relations are included, and the source and target elements are different (i.e. ignore self-referencing element relations). NOTE: The black arcs are Core relations; the red arcs are Derived relations. In the current version of the MMOR, there’s approximately an order of magnitude more Derived relations vs. Core relations. Return and visualize all of the Core relations in the MMOR. NOTE: It may look pretty but it’s not very useful from a functional perspective. To fix this, try grabbing the Passive Structure elements and dragging them to the left; the Active Structure elements, moving them to the right. The Behavior elements can be left in the middle. They will act as if they are connected to the Passive and Active Structure elements by elastics or springs. You can also manually position the Behavior elements similar to what you did with the Structure elements. Go ahead and try it for yourself. 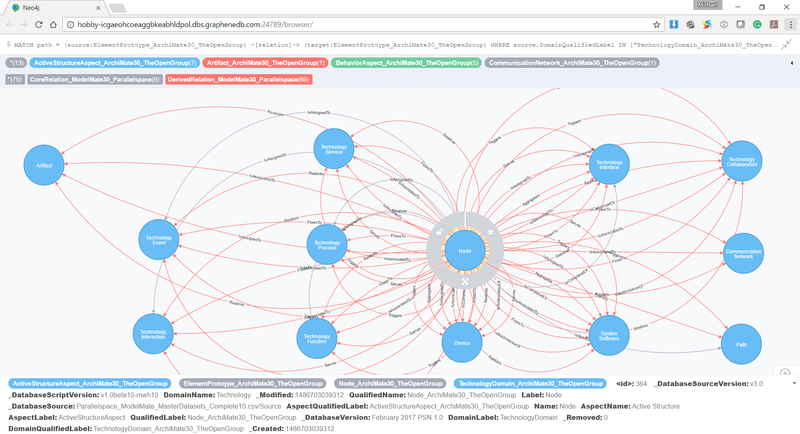 There are several additional visualization tools in the market that work substantially better than the default browser app that ships with the Neo4j graph database. 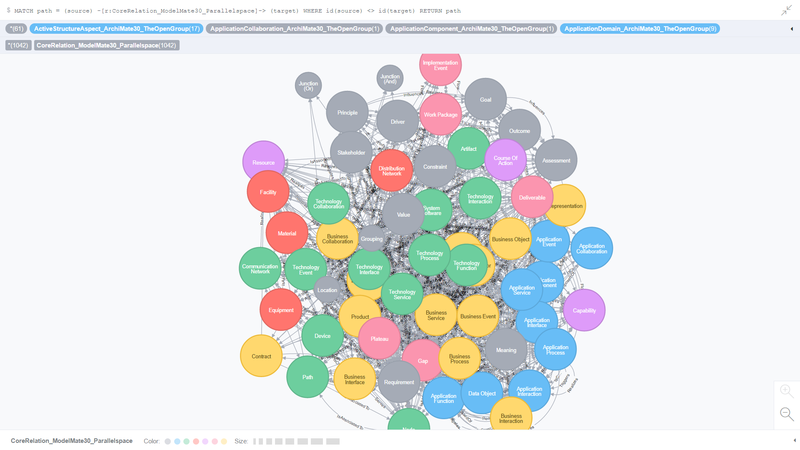 Check out this page: Graph Visualization for Neo4j. Linkurious is one of my favorite graph visualization apps. Return and display a statistical matrix describing the element prototypes in the MMOR. in addition to the element’s specific ArchiMate prototype (e.g. Value_ArchiMate30_TheOpenGroup). Neo4j Cypher Query Language (CQL) file. In addition, there is a ZIP file containing all 4 file formats. *ArchiMate is a registered trademark of The Open Group.